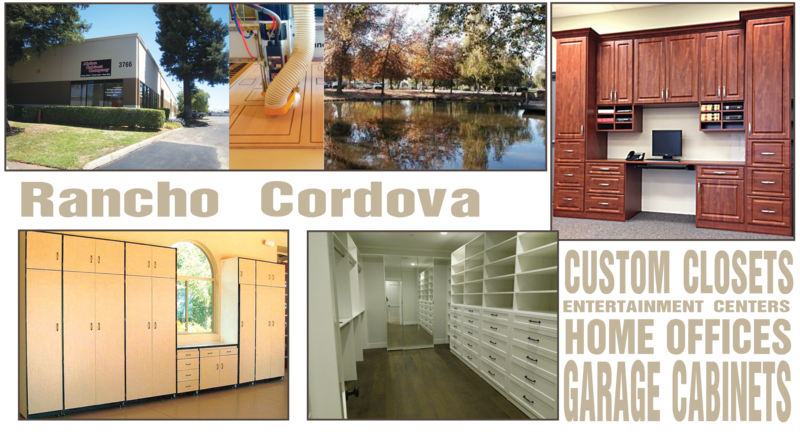 Rancho Cordova, California - Alpine Cabinet Company "
Established in Rancho Cordova since 1984, Alpine Cabinet Company provides storage and organization solutions specializing in garage cabinets, custom closets, home offices, and entertainment centers. As a family-owned business, we provide exceptional personal and professional service with a free in-home estimate, design services, and custom installation. We build our cabinets in our Rancho Cordova manufacturing plant to your design specifications. Our garage cabinets are built to provide you with superior strength and stability with a patented steel bracket engineered to withstand more than 5 times the weight of an ordinary shelf pin. Our custom closets are designed for the ultimate organization and storage solutions. Alpine’s home offices resolve all of your professional and personal needs. Entertainment centers are designed to discretely store your electronics and highlight your collectibles. All of our cabinets are designed to your specifications and design esthetics with your choice of accessories, finishes, and lighting. Contact us for your personal storage and organization solution. Serving Rancho Cordova and surrounding communities such as Rancho Murrieta, Fair Oaks, Carmichael, and Rosemont.